These are just my suggestions and things that have been successful for other twin parents! I’m by no means promising a quick fix or guaranteed solution. So, there are really two options. The first option is to treat it as a discipline issue and teach them to stay in their bed. The second option is to make it so they physically can’t get out of their bed, and I’ll talk more about those options below. At some point, it is appropriate to put your children to bed and expect them to stay there because you are the parent and you told them to. Once you have told them that they must stay in their beds and they get out, there should be some sort of discipline for not listening. The problem with disciplining a toddler at bedtime is there’s not much you can do that will really hit home. I’m not a big proponent for spanking, you can’t put them in timeout, and revoking a privilege or taking away a toy won’t have any effect in the moment. If you have an extra bedroom, you could try separating them until they earn back the privilege to be in the same room when they stop climbing out of their crib. I am usually a big picture kind of parent. I consider the long-term implications and don’t often take shortcuts, especially when it comes to teaching my children obedience. HOWEVER. This is just a battle I am not willing to fight. My twins aren’t currently climbing out of their cribs, but if they were, you bet I would be choosing the easy way out. Lessons in staying in their beds can wait until they’re 3, or whenever I have the guts to make the crib to bed transition. 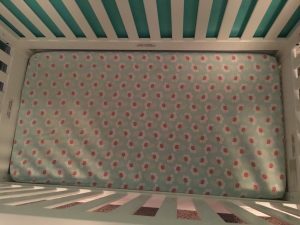 Twins Climbing Out Of Cribs: How to Keep Them IN! The first (and free!) option is to lower the mattress all the way to the floor. 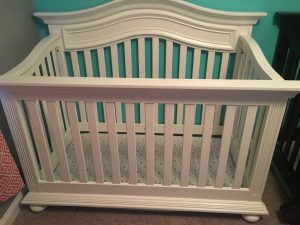 The chances of this working depend totally on the style of your cribs! 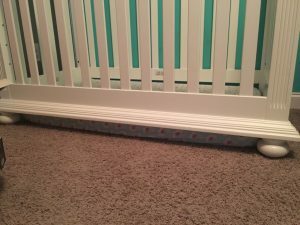 If the sides of the crib are low enough to the ground and your mattress is thick enough, it will work. If there is a space between your mattress and the crib, then I don’t think it will work. I have a friend who’s twins started climbing out of their cribs before they turned two, and this is what they did and it worked perfectly. Here are some pictures she sent me so you can get a better idea of what I’m talking about. 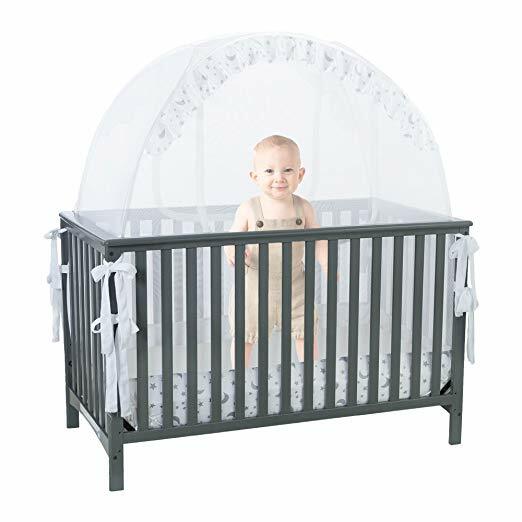 The second option is to purchase a crib tent. These tents go over the top of the crib so your toddler can’t climb out. The reviews on these things are fantastic! They are full of relieved parents who were exhausted from their toddlers getting out of their crib. The downside to these is that they’re around $112 and obviously you need two of them if both twins are climbing out. That’s a big chunk of change! I know many twin moms who have used these and have loved them, but I have not personally used them myself. A note regarding crib tents: these have been my plan for if Josie and Margo climb out of their cribs. There is a bit of controversy around whether or not they are indeed safe and one brand has been recalled. If you purchase a crib tent, watch your children with a video monitor to make sure everything is going smoothly. I have also known many parents who put their toddlers in sleep sacks to prevent them from climbing out. I think this depends so much on the child! Some children would still try to climb out, thus making it more dangerous that they can’t fully use their legs. If you have no success with any of the above methods, remove everything from their room they could get into. Dresser, clothes, toys, etc. Put a mattress on the ground for them to sleep on so that they don’t get hurt climbing out of a crib or falling out of a bed. Lock the door or use a baby gate because it is NOT SAFE if your toddler is roaming the house in the middle of the night. 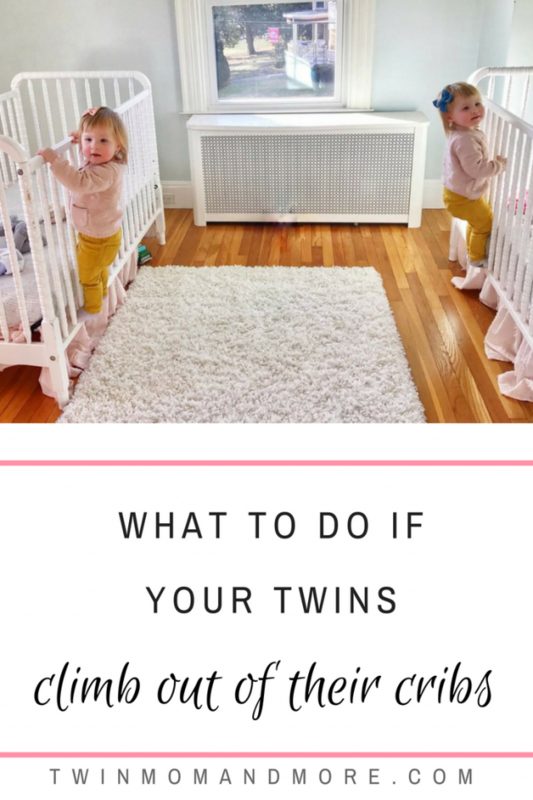 I hope this post helps you figure out what to do if your twins climb out of their cribs! I wish there was an easier solution, but it depends on so many factors. Good luck! For more parenting tips, be sure to follow me on Facebook!